I'm going to start by saying, I'm glad I waited to write this review. 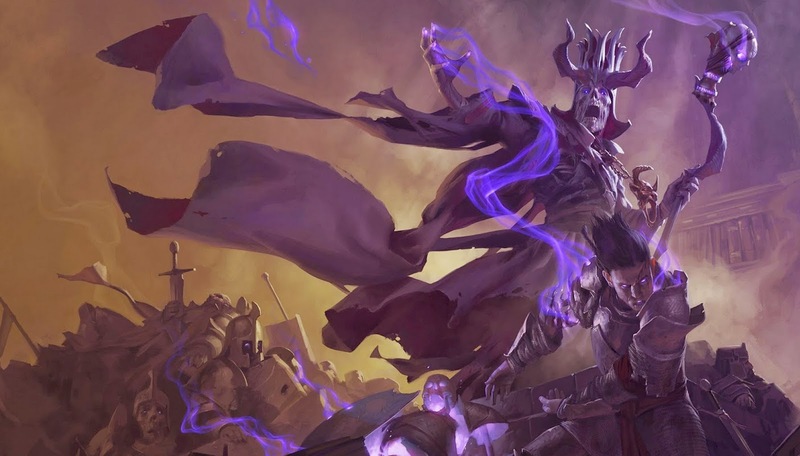 There were a lot of things about the newest edition of Dungeons and Dragons that I really needed to spend some time on; my opinion needed time to formulate and evolve past what I had played at PAX. I needed to add a little more experience with the new rules to the mix. Initially it seemed almost too simplified, like maybe Wizards of the Coast had jumped on the rules-lite bandwagon that's been fairly popular these days, but the simple introduction turned out to hide a fairly complex, but accessible, system. To start: The art is great, with a strong selection of beautiful hand drawn pieces. There are a few pieces of digital art, which I'm less fond of, but even those are aesthetically pleasing and appropriately placed. The book uses the same strange magic as the new Monster Manual, and takes up remarkably little shelf space considering the amount of content. Seriously, it just isn't as thick as the page count and font size are telling you it should be. The classes follow a pretty straightforward progression, and this is where we start to get into something that is simultaneously a strength and weakness of the game: there aren't a lot of choices to make once you've created your character. Initially there's all kinds of options (or later options for options since feats are an optional mechanic in this game) such as race, background, trained skills, stat distribution, class, etc. But once all of these are locked in, there isn't a lot of room left for organic growth. At 2nd or 3rd level you'll be able to pick a path or archetype for your class (though odds are you already decided on this when you made the character since your earlier choices will heavily influence which paths are most beneficial) and then every 4 levels you can, assuming you're using the option, gain a feat or a point in one of your ability scores. For some players, this is actually a good thing; they don't want to waste a lot of time on distributing skill points, figuring out feat trees, etc. For others though, character creation and growth are big parts of the game, and the newest edition falls a little flat there. If you enjoyed the nuanced character development of 3.5, this might not hit the right notes with you. One example of the gorgeous new art for 5E..
That being said, the classes and paths are all unique and interesting, and the guys at Wizards did a smart job of letting you jump directly into character concepts that used to be less accessible in older editions of the game. The eldritch knight is back, and it's a Fighter path you can jump directly into without any multi-classing or prereq shenanigans, and other familiar faces from past editions like the arcane trickster and frenzied barbarian make revamped appearances as well. Balance in the new game is handled very well also. All of the classes are pretty well balanced to each other, without having the cookie cutter feel 4the edition was often accused of, where people would say that if you erased the name and keyword off a power card you wouldn't be able to tell what class it was supposed to go to. Spellcasters have been reined in a bit, with their most powerful spells toned down and their general casting mechanic made both more accessible and a bit less all powerful. Spells no longer auto-scale, and instead require you to spend higher slots if you want to get more out of your lower level spells. It's actually very reminiscent of a slot-based version of the mechanics used in the Expanded Psionics Handbook from 3.5, and it really works well and intuitively. The more martial classes have lots of goodies to play with as well. The Fighter has 3 archetypes available to choose from, essentially a "leader", "striker", and "defender" option, allowing the Fighter to encompass ideas that used to be relegated to supplemental materials like the 3.5 Book of Nine Swords or 4e's Warlord. The new changes make for a much more complete and versatile warrior class, and who is clearly delineated from the barbarian, paladin, and other classes who have traditionally occupied the same roles (and often done a better job at them). Combat and skill challenges are all resolved with simple checks involving your proficiency bonus, your stat bonus, and a d20 roll. Some situations may dictate that you have advantage (roll 2d20 take the highest) or disadvantage (roll 2 d20 take the lowest). This fairly simple and universal mechanic allows the game to flow at a much faster pace, which can be great for advancing a story and getting more done. In the times we've played, we've never had a combat drag out more than 20-30 minutes, a vast improvement from the 3.5 days where a single combat might stretch into an hour or more. The more rapid pace allows the game to move along at a good clip and helps to keep players (and DMs!) interested and invested in what's happening at the table.